Is a city of art nestled among the Colline Metallifere (the ‘metal-producing hills’), surrounded by the countryside of the Maremma region, a place which boasts a wealth of historical, environmental and architectural treasures, passed down to us from a prosperous past. From the old medieval district to the Città Nuova (the so-called ‘New City’), visitors can stroll along steep, ancient alleyways that weave through the historic heart of the city and climb till they reach the town’s summit. Here you can easily find picturesque, pretty spots and fabulous views that stretch out over the valley down to the sea. 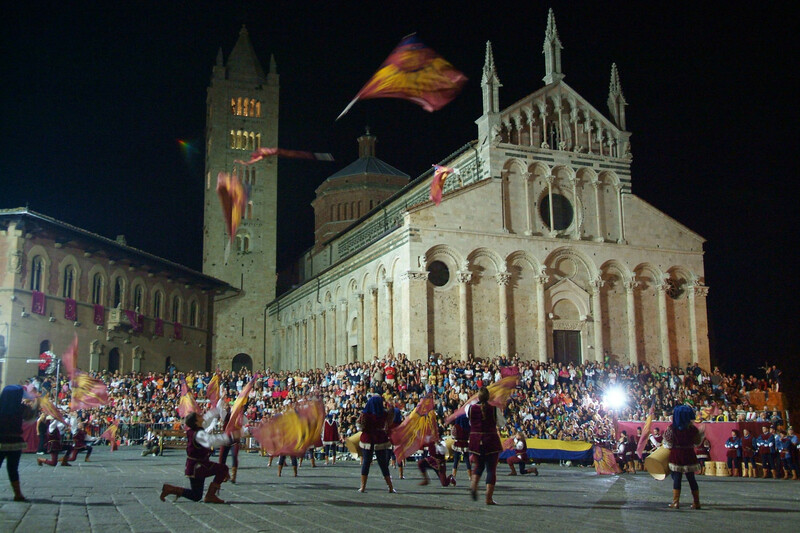 Many of the city’s most important sights are located on the city’s main square: the marvellous Cathedral of Saint Cerbonius, the Town Hall, the Fonti dell’Abbondanza fresh water spring that surrounds the famous affresco dell’Abbondanza and Palazzo del Podestà, the building that houses the archaeological museum. Climbing up to the Città Nuova district, visitors will come across buildings dating from the 13th century: the monastery of San Pietro all’Orto, with its cloister of St. Augustine, the Torre del Candeliere and the Sienese Fortress. Tourism is becoming the town’s leading industry: aside from its historic buildings, monuments and museums, the city offers sporting activities such as hiking, bicycle tourism and horse riding. 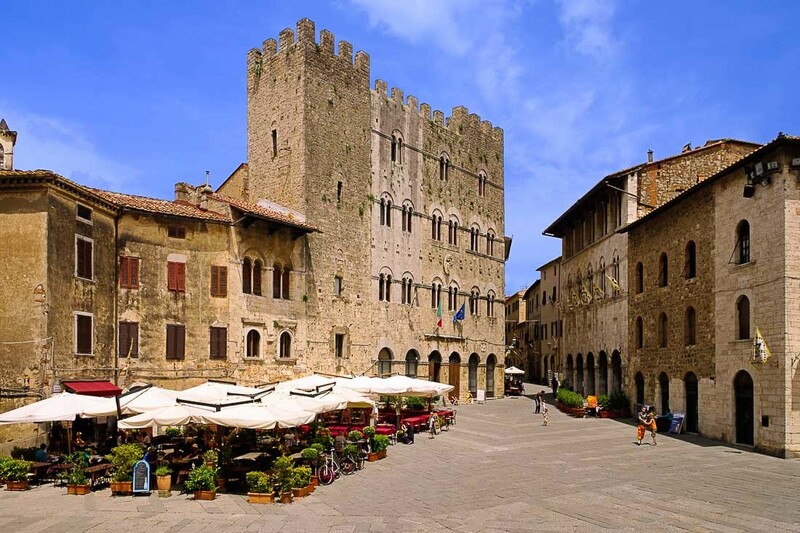 Tourists and visitors find the following events, which take place every year in the city, particularly interesting and exciting: the Balestro del Girifalco, the Toscana Fotofestival, Lirica in Piazza and Calici Sotto le Stelle. 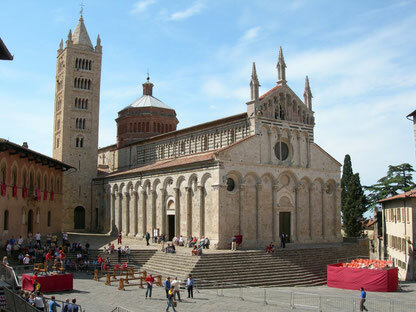 It is the best known and most representative monument of Massa Marittima, one of the greatest examples of religious architecture in the Romanesque style in Italy. Expertly engineered in oblique and higher position with respect to the square so that it seems more stately, its construction was begun in 1228 above a first Romanesque group of the 12th century and it was enlarged by Giovanni Pisano in 1287 with the apse, built in the Gothic style, modern for that time. In order to harmonize the entire structure, many Gothic elements were also included in the Romanesque facade, such as the tympanum, also work of Pisano, and pinnacles. 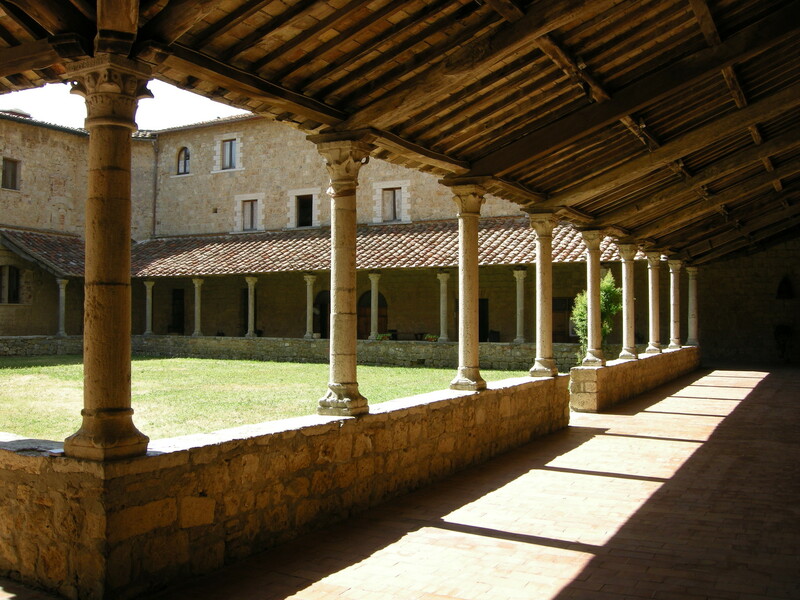 In the early 14th century the side chapels were added. 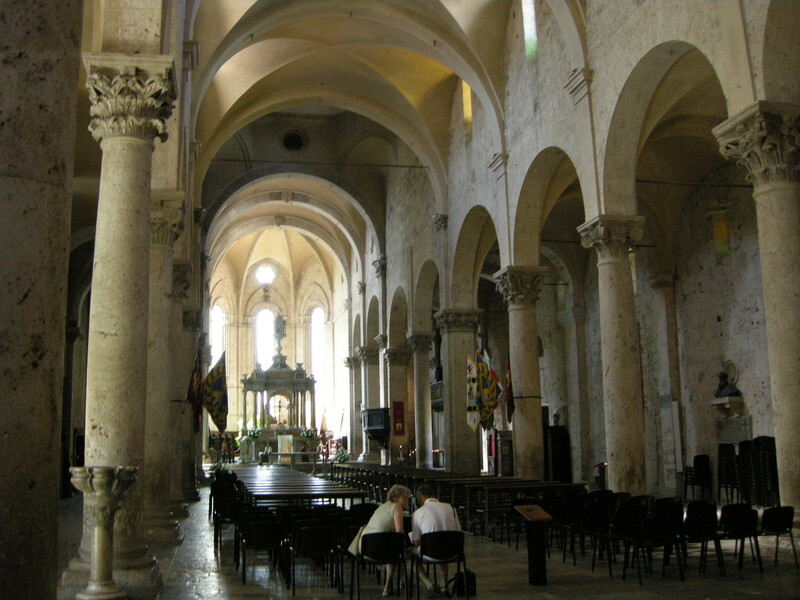 The interior is divided into three naves and contains notable works of art, including La Maestà (Duccio – ca 1316), the Ark of Saint Cerbone (Goro di Gregorio – 1324) and the Baptismal Font ( Giroldo da Como– 1267). The bell tower, about 38 meters high, is divided into several floors with double, triple, quadruple and quintuple windows on all four sides. Lake Accesa is a small and unusual lakeside habitat surrounded by oaks, holly oaks and reeds, as well as the remains of an Etruscan civilisation that seems to have already settled there in the 9th century bc, not to mention the traces of more recent mining and agricultural activities. From excavations carried out in the area in the past and as yet ongoing, a great deal of evidence has emerged of the existence of an Etruscan settlement dating from the 7th-6th centuries bc on the banks of the lake, as well as tombs that testify to a human settlement in the area from as far back as the 9th century bc. This settlement, divided into districts and recognised as one of the few urban centres known in Etruria, was part of a series of small towns located in the sphere of influence of Vetulonia, along routes that were linked to the mining activities carried out in the region. Thanks to the nearby existence of mineral deposits, the Etruscans were able to extract silver, lead, iron materials and gold there. 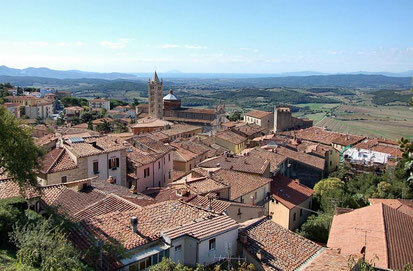 The Etruscan industrial district developed in the nearby hills. Artefacts from this era are all preserved in the Park of Etruscan Civilisation set up by the borough council and other local authorities in partnership with the University of Florence in 2001. 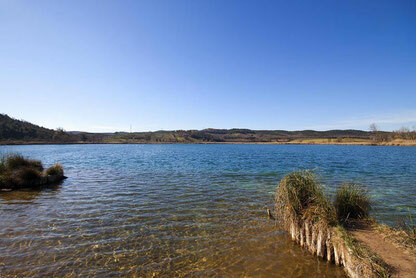 Today, the lake is a tranquil place where visitors can swim surrounded by countryside. The lake is fed by the Bruna River and spreads out in a transparent pool with a depth that varies between 65-230 feet.